One of my favorite projects we’ve tackled recently was trimming out the windows in our dining room. 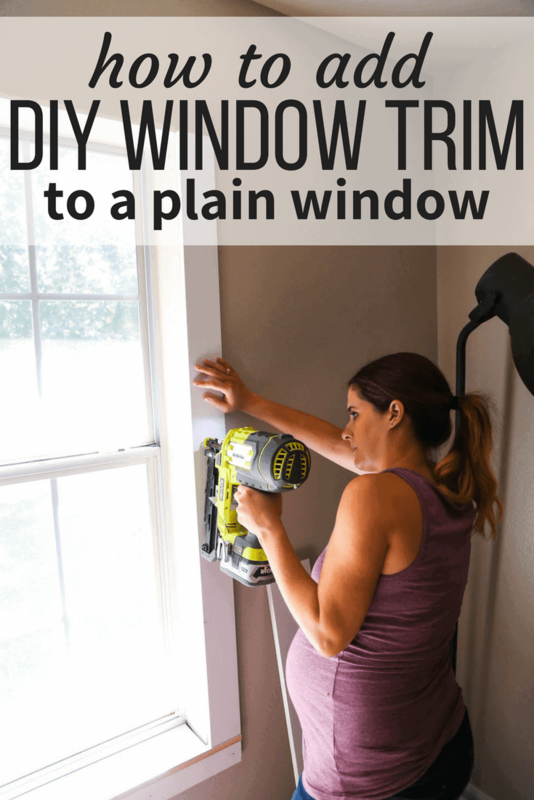 We decided we wanted to take on all of the windows in the house eventually, so today I’m sharing the full DIY process for how to trim a window (it’s so easy!) in the nursery. 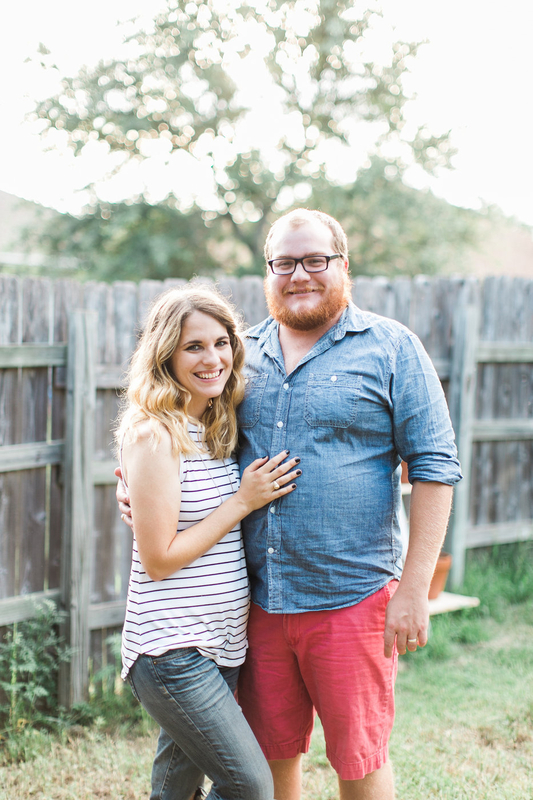 Corey and I live in an area of Texas where most of the houses don’t have a lot of, um, personality. Like, at all. There are a few gems in our area, but for the most part, our little town didn’t start growing until the 80’s, which means that aside from a couple of (gorgeous and expensive and way out of reach) historic/unique homes, the vast majority of our options are builder-grade tract homes built in the 80’s or later. 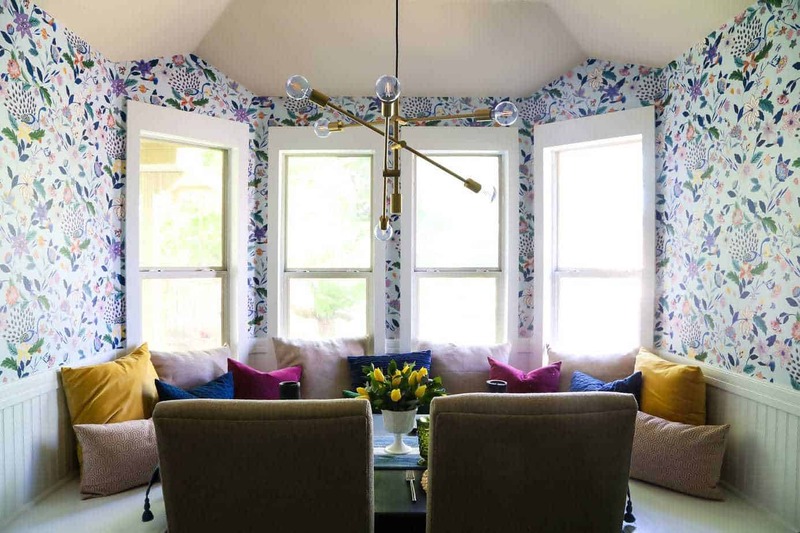 While we both dream of someday finding a gorgeous old home or one with a ton of architectural interest and fun details, we also really love the challenge of taking a plain, boring house and turning it into something special. That’s why we’re constantly doing things like adding wallpaper, fun wall treatments like DIY board and batten, and changing up fireplaces – because we believe a lot of a home’s personality lies in those little details! 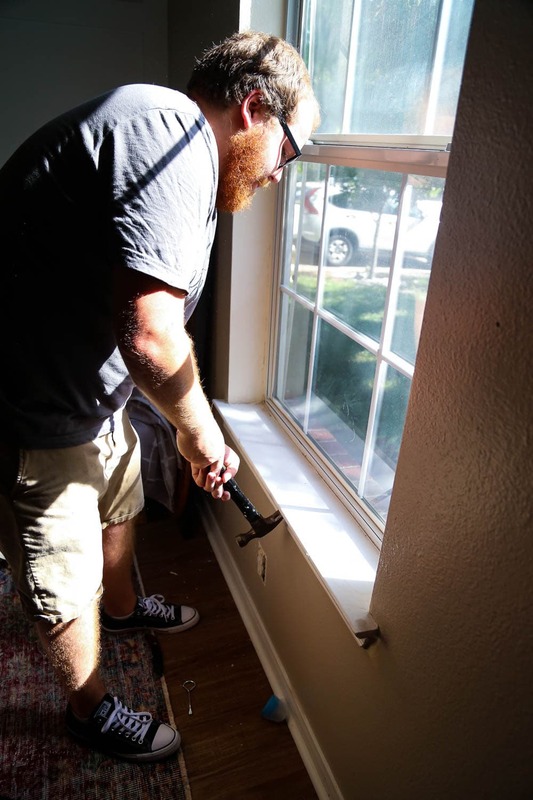 One detail we’ve always wanted to have was window trim. 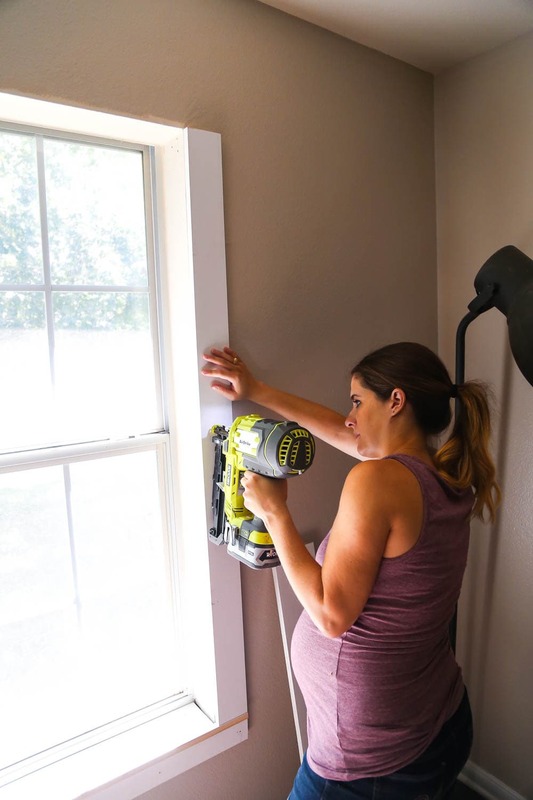 Our windows have always just had plain old drywall all the way around, but we knew they could feel a little more special with some trim around them – so when we tackled the dining room renovation, we decided to try it out. And, holy cow, did it ever make a difference! The best part about it was, it only took a couple of hours (for all 4 windows!) and was incredibly affordable. Why wouldn’t we do this on all the windows in the house?! Side note: We were so spoiled in our old house with tons of giant windows that it’s still hard for me to wrap my brain around the fact that there are only 10 (small) windows in this house – and 4 of them are in the bay window, which means they probably should only count as one. So, essentially, 6 windows. I guess that means it’ll be a quick process to do them all?! Our goal is to take on each window as we tackle a space. So, since we’re currently focusing on the nursery and needed to hang some curtains, it was time to get it done. I didn’t share the process last time and had a lot of interest in how we got it done, so I wanted to be sure and share what we did this time around. 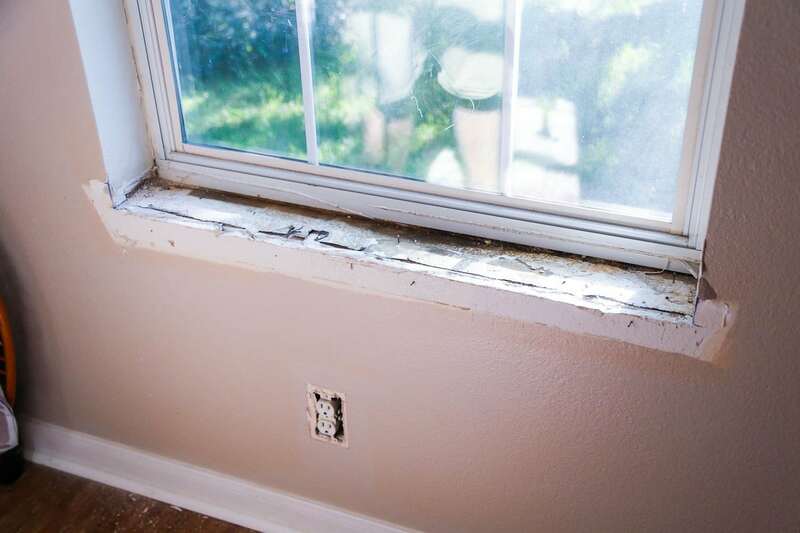 The first step is to remove the old windowsill so you can ensure everything matches. We just used a sharp blade to score all the way around, then used a small pry bar and hammer to peel it right up. If you can, try to keep the entire windowsill intact so that you can use it as a template to cut your new one! A small note – we actually decided to take a really minimal approach to the windowsills throughout the house with our new trim – we kept it very shallow and it has almost no overhang. We did this in the dining nook because we didn’t want the sill to be poking anyone’s back while they’re trying to eat dinner, and we liked the look so much that we decided to continue it throughout the house. We don’t really use our windowsills to hold anything, so it works well for us – but obviously, if you want to keep yours deeper you absolutely can. You’ll want the new windowsill to be the first thing you install. We used the old one as a template but, as I mentioned above, cut it a bit shallower so that it didn’t hang over the edge of the drywall much. Corey used the table saw to cut the 1×8 board down, and then the jigsaw to cut out the part that would overhang the window on either side (since we wanted the windowsill to come out to the edge of the side trim). Once you’ve got it cut (and you’ve made sure it fits! ), simply add some construction adhesive to the back, slide it into place, and add a couple of nails for good measure. Next up, you’ll cut a 1X3 piece for the apron underneath the windowsill. Use a combo of construction adhesives and your handy dandy nail gun to install it. If you don’t have a long enough piece (as you can see, we didn’t since we were using leftovers from the dining room windows!) it’s fine to use two. You won’t be able to tell the difference once you caulk and paint! 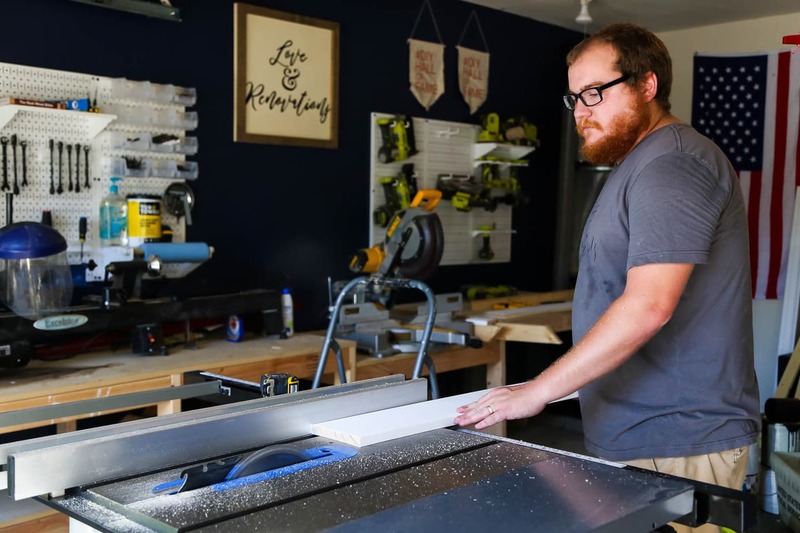 The next step is to cut down some 1X4 boards to the height of your window (go only to the top of the window), and then use the same method as before to install them. 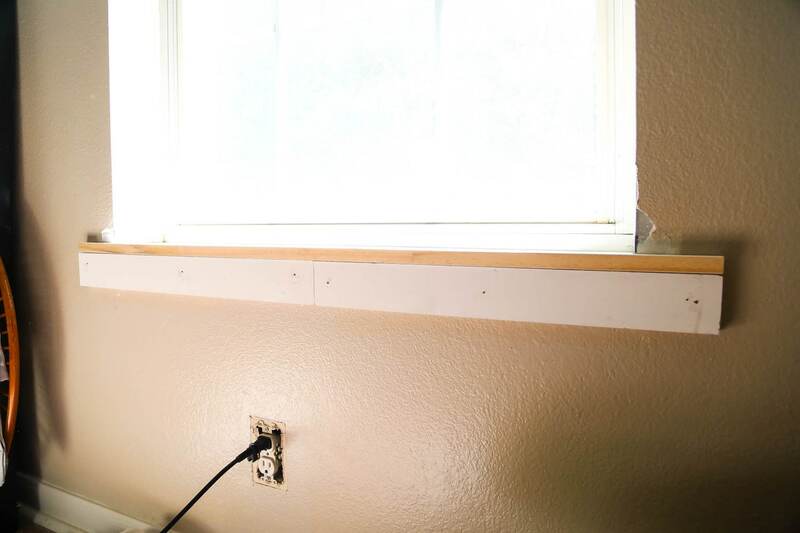 Optionally, you can also install some boards on the inside of the window box to cover up the drywall, but we simply lined our boards up with the edge and then painted the drywall next to the windows to match. It saves some material and doesn’t leave you with a weird area where the two pieces of wood meet. Plus, once it’s all painted you can barely tell the difference! Lastly, you’ll want to cut your other 1X8 board to span the top of the window (plus the width of the side boards) and then install it! I’ll note here that there are a ton of different ways you could set this up – some people install a small 1X2 piece underneath (or on top of) this board to add some extra depth, some people use different sizes of wood for a chunkier look – you can really do whatever you want here! We went for a very simple look with no extra flourishes or details. 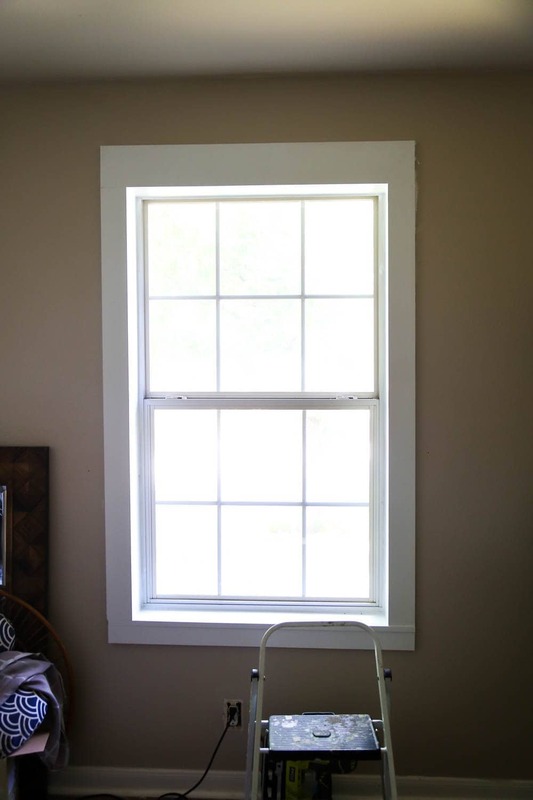 But, there’s tons of inspiration out there for fancy window trim if you want to get creative with it. And finally, the most satisfying part of any woodworking project – the finishing touches! Caulk all of the seams and where the wood touches, let it dry for an hour or so, then paint the whole thing! This is always the step that makes the biggest difference, and even if you feel like things are looking a little crazy, I can almost guarantee this will fix that! Once we were finished with the trim, it was time to add our new window treatments. 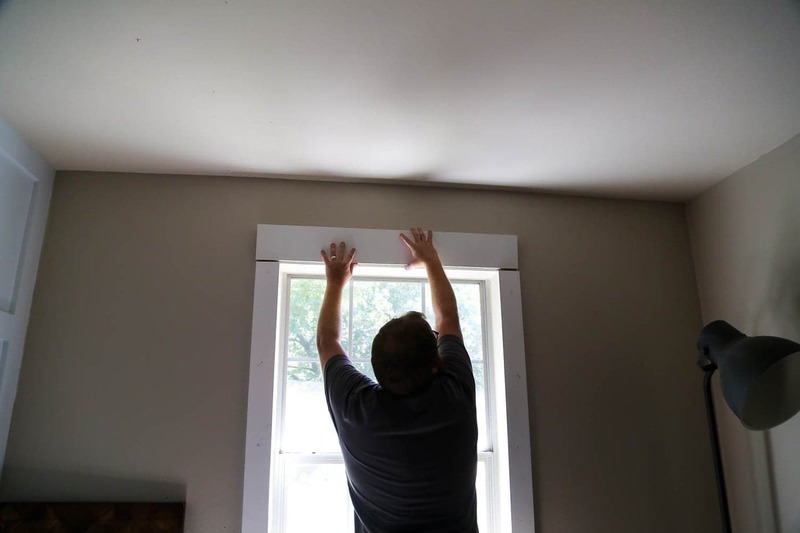 I was really excited about this part – since we left the windows in our dining room bare, I was really curious how the trim would look when blinds and curtains were added in. The answer? Fantastic. It looks fantastic. We hung these curtains from Target (along with this curtain rod) and I feel like it really helps the whole thing come together. 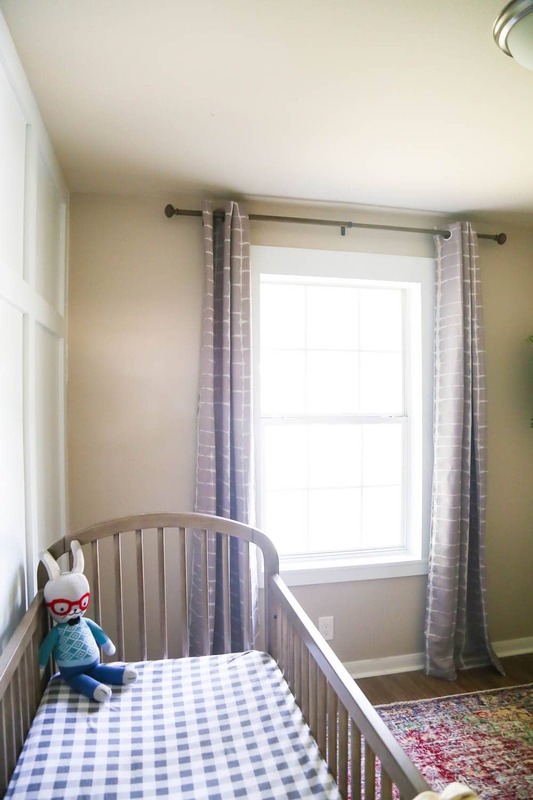 The curtains play so well with the other patterns in the room, and they’re room darkening which is perfect for a nursery. We still want to add in some blinds (we’re thinking of using these from IKEA – anyone have experience with them?) but other than that this little window area is done! I’m so excited about how the nursery is coming together, and I can’t wait to share the full reveal. We’re really down to just a few more details that need to be completed (like replacing the doors, adding a ceiling fan, and doing a bit more accessorizing) and I’m finally feeling confident that we’ll be able to get this room done before our little boy makes his arrival. Thank goodness. I was worried for a minute there. Please let me know if you have any thoughts on the IKEA cellular blinds, or if you have any other fabulous suggestions for us! We’re not big fans of the plain ol’ faux wooden blinds that we have throughout the house, so we’re trying to figure out exactly which route we’d like to go (my vote is always for bamboo blinds but Corey feels a little “been there done that” with them since we had them throughout the old house, and is wanting something different). I’d love your ideas! Love this simple tutorial! So quick question: I know for the windowsill, you said you just used construction adhesive and then nails for extra support. Is that what you did for the trim too? Just construction adhesive and nails? Can you see the nails through the paint? Hi Sara! Yes, we attached it all with construction adhesive and nails. And no, once you add caulk or wood filler to the nail holes and paint over them, you can’t see them at all. I made roman shades for both of my bdrm windows and I lined them with special room darkening fabric. They look classy and they let in a lot of light during the day and none suring the night. They are not hard to make either. We have JCP room darkening cellular blinds (DO NOT buy the Mirage style). I wait for a sale and google for a % off coupon. We love these and have put them in our entire house. Good to know! Thanks, Carole! Well done! Love the new look. For nursery, there are lots curtains match with the bedding. That’s my favorite. I had one of the Ikea shades in my bathroom. It worked really well, but it was almost always closed because the window was right next to the toilet. I ended up going with a window film on the bottom window pane instead, and left the top pane see-through so you could see the trees in the yard, but I imagine that you wouldn’t want to do window film for a bedroom. I don’t know if you need a shade on this window, especially right now when the baby is young. Maybe wait and decide what, if anything, you want to use in the rest of your house so that it all matches. I don’t have any shades in my house now – only curtains.